l remember the morning of September 6, 2006. We woke up to the news that Steve Irwin – aka The Crocodile Hunter had been killed by a sting ray. JL and I sat there in disbelief. I began to cry and could not stop. All I could think about were Terri, Bindi, and Bob – Steve’s family. Bob was only a few months younger than NHL at the time. How do you tell a child that age that their daddy is not coming back home to see him? It hit hard. Only a day later I found out that I was expecting #2 and I continued to cry over Steve Irwin. I have many happy memories of watching The Crocodile Hunter and snuggling up on the couch with JL when we were first married. We would sit there on snowy days and tune into Animal Planet and watch in awe of Steve and Terri’s amazing adventures.Our favorite days were the marathons of the shows. Were they crazy? No, they were doing everything to show all of us how wonderful animals are and why we should help in their mission to preserve their habitats and save wildlife. A few weeks back Terri Irwin, Steve’s widow, was on a few talk shows promoting her new book Steve & Me. Since I have always been fascinated with their shows and was so saddened by the loss of Steve I wanted to read the book. Yesterday I finished the book with tears in my eyes. Reading how Bob would sit in his bath and cry for his daddy just pulled at my heart strings. Steve & Me is not a traditional autobiography, instead it is a compilation of stories written by Terri about how she met, fell in love, married, started a family, and ultimately lost her soul mate in Australia. Terri writes beautiful stories about Steve and her love for animals and how they continued this with their children. Reading about his love of being a daddy and doing everything for his kids and their future at the Australia Zoo they called home. What struck me most was how Terri stated over and over that Steve had always known he would pass away young. He just wished it was not done by a crocodile, since that would hurt all of his years of work. Thanks to this premonition he worked even harder to do more during his time here with us. NHL knows who Steve Irwin is and loves to watch Wiggly Safari where they are based at the Australia Zoo with the Irwin family. He even puts goggles on from time to time to play Croc Hunter. CRIKEY! 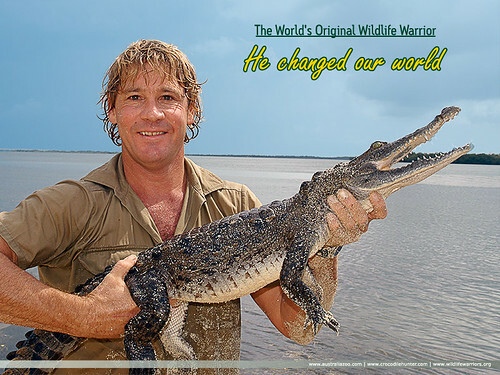 We hope to continue the tradition of watching old episodes of The Crocodile Hunter with NHL and JSL to show them the beauty of animals in the world. In addition to this we have started to watch Bindi the Jungle Girl (a show that started to film just before Steve’s untimely death). "Crocodiles are easy," Steve said. "They try to kill and eat you. People are harder. Sometimes they pretend to be your friend first." R.I.P. Stevo and know your family and friends are doing a wonderful job keeping your dream alive. One day I hope to visit your zoo and watch the cockatoos in their native land. Renee: Thanks! This will probably be the one and only year that we were able to get away with the matching outfits. I hope you and your family have a wonderful New Year!